Azerbaijan's Defence Ministry has digitally removed an Armenian flag from a photo of Russia's military parade on Saturday, Armenian reports say. 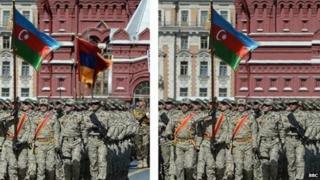 The flag of an Armenian unit marching behind Azeri troops is not visible in the image on the ministry's website. But a live broadcast of the event showed both units walking one after the other with their flags. They were in the Russian capital to commemorate the Soviet victory against Nazi Germany in World War Two. Arranged in order of the Russian alphabet, troops from the two countries of the former USSR joined other foreign troops marching through Red Square to mark the 70th anniversary of the end of the war in Europe. Azerbaijani military expert Uzeyir Jafarov told BBC Azeri that he had no doubt the image had been Photoshopped. "According to sources in the ministry, they did not expect the military units of Armenia and Azerbaijan to march one after another. During rehearsals they were in different parts of the area," he explained. Meanwhile, the Armenpress news agency website observed that "as a result of this fraudulent act, the artistically unique facade of the building of the Russian Museum of History looks different". The museum in the background had lost one of its windows in the Defence Ministry's version of the photo, another keen observer told Russia's Regnum news agency (in Russian). Azerbaijan's Defence Ministry has declined to comment on the reports. The question over whether the photo was doctored has also been actively discussed on social media sites in both countries. Relations between Armenia and Azerbaijan have been strained since the 1990s conflict and continuing dispute over Nagorno-Karabakh - a landlocked region in Azerbaijan with an ethnic Armenian majority.